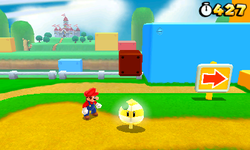 World 1 is the first world in Super Mario 3D Land. It takes place in a green field with flowers, pipes and hills in the background. It features five levels, a Mystery Box, and a Toad House. As the start of Mario's adventure, the levels of World 1 are rather basic. 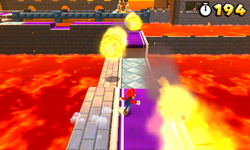 This world reappears as a background for Dream Figure Skating in Mario & Sonic at the Sochi 2014 Olympic Winter Games. World 1-1 The first course in the game. 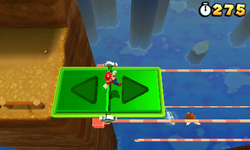 World 1-2 The first underground course of the game, with Swing Spikes. World 1-3 An athletic course high in the sky. World 1-4 An athletic course with Switchboards. Requires 3 Star Medals to be unlocked. World 1- The very first Castle course of the game. Three Piranha Plants. Defeating the Piranha Plants causes 15 Coins and a Star Medal to appear. Three Goombas. Defeating the Goombas causes 15 Coins and a Star Medal to appear. A red Biddybud walking around a Fire Flower. 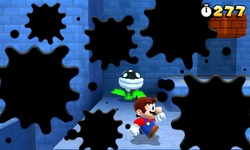 Defeating the Biddybud causes 15 Coins and a Star Medal to appear. A golden Mystery Box containing 15 Super Leaves, a P-Wing, and two Star Medals. 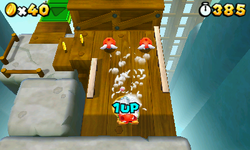 A golden Mystery Box containing the game's five supporting Toad characters and two Star Medals. This page was last edited on February 10, 2019, at 11:51.